Our brand new jewelry cabinet contains the best secret a woman dreams of! 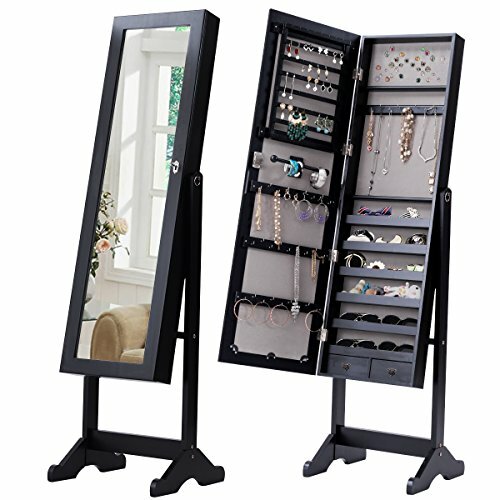 Get all your jewelry out and untangled your necklaces for your very last time before organizing them in this gorgeous mirror. Its inside is made of a protective gray fabric lining to prevent your jewelry from getting scratched and it has room for your earrings, necklaces, rings and more. Moreover, you could also keep your makeup inside, making your everyday beauty routine of getting ready easier and faster! It features lockable function, the equipped lock with keys safely keeps your valuables stored. And last but not least: the mirror is adjustable. It has 3 angle tilting positions, choose your favorite angle for a better view. Don't hesitate to add it to your cart! 【Contemporary Design】: Giantex Mirrored Jewelry Cabinet, sophisticated and luxurious, this jewelry armoire is made of strong and durable MDF. The classic black finish can coordinate well with virtually any room decor. 【Amazing Storage Capacity】: 8 lined shelves designed for holding earrings (64 earring slots), 1 rod for scarf and bracelet, 36 hooks designed for hanging necklace and bracelet, 50 ring slots, 6 shelves designed for holding other items, 2 bottom drawers. This roomy armoire easily gets all your jewelry neatly organized and maintained in good condition. 【3 Angle Tilting Design】: The Cabinet features 3 angle tilting positions, choose your favorite angle for a better view. 【Additional Protection】: The protective gray fabric lining prevents your jewelries from being scuffed and scratched, while the equipped lock with keys safely keeps your valuables stored. 【Assembly required and easy to clean】: We offer explicit and understandable installation guide, helping you easily set up the cabinet. All hardware included. With a wipe-clean surface, easy to clean. Optional Shelves for Universal Wardrobe/Armoire/Closet by Palace Imports, 5636, Java, Pack of Two. 8 Metal Pins Included.